If you're lucky like me, you have one of those friend circles that's been together since the early days (and very late nights) of pool parties and poker nights. Beer pong and bar hopping. The same group of people who will be gathering in someone's Family room 20 years from now, with wine and the same but not tired inside jokes. These people are loyal and a second Family in many ways. We've endured break-ups, witnessed get-togethers, danced at each other's weddings, become homeowners and begun parenthood together. Our roots began many years ago and seemingly, everyone has these relationships that they've been building since they were little. This can make it hard to forge new friendships as an adult and find a way to fit other people into your life. ...Until you become a Mom, I think. Then all of a sudden, you have this little human by your side who is a magnet for conversation starters. How old is he? He's so cute! What's his name? Is he talking yet? Before I had a baby, there would have been no catalyst to facilitate such an in-depth convo with a stranger in the TJ's line. But now that I'm always out in the world as a duo, it happens constantly and it's a strange concept, really. Sparking discussion with a stranger, trading "me too" and "I know the feeling"(s), feeling suddenly connected and hoping you have more in common than your children. It feels similar to the beginning of a blind date and so far, I've been been really lucky with "swiping left," to put it in modern dating context. Together, Ronan and I visit a lot of play spaces - Every single one in Dupage County to be specific ;), including our local library on a weekly basis. Because we are there so often, I have begun to recognize many of the familiar Mom faces who are also on a mission to simply get out of the house. Last September, I was chasing him around the children's area and noticed (an admittedly trendy looking Mom with cute style I was eyeing) doing the same with her toddler. I asked how old her son was and minutes later, we were deep into a conversation about how our beloved dogs have now become pests and nap schedules. We went to breakfast a few days later which felt totally normal, as if we had known each other for years. Without a second thought, we launched into a conversation about our lives: Our backgrounds, kids, aspirations, Mom wins/losses, working from home challenges, etc. I found it so easy to connect with her and found myself texting her almost every day after. It's now 7 months later and she has become one of those girlfriends I feel I can trust with anything. She moved here last year not knowing anyone and sometimes, it feels like we were supposed to meet that day. As another recent example, I met a Mom through Ronan's music class. If we're being honest, he isn't always the most compliant child, especially in a structured group setting because he's very much an explorer who has no interest in sitting or following the leader. This was very obvious to the rest of the class, as I spent most every week chasing him and pulling him back to my lap, with one specific class being harder than the others in terms of testing my patience. That day, this Mom reached out and said something that made all the difference: "Trust me, you're not alone." Sometimes, that's all we need to hear, isn't it? The next class, I mentioned grabbing lunch sometime, we exchanged numbers and met up for a playdate a week later. These kind of interactions do take a little bit of "going out on a limb" to reach out and extend an invitation. Who knows if the other person is going to think it's strange or be a total mismatch when you actually get to know their personality? But I think more often than not, we are open to solidarity in Motherhood and womanhood in general. We welcome connections with others who make us feel good and those we can call on when we need something. Those who can empathize, making us feel less alone in all of life's challenges. Ronan has definitely allowed me to become more extroverted and candid with new people and if you're willing to expand your social circle, I think children offer so many opportunities to meet a lot of amazing women who may end up being in our lives forever in one way or another. He has also allowed me to become closer with many of my longtime girlfriends, by making me more vulnerable and strengthening our bonds. Outside of my husband and immediate Family, it is my girlfriends who have been the biggest support system during these first few years of Motherhood. I have relied on them for so much, whether it was their shoulders to cry on, breast feeding how-to sessions, text threads with free advice that's worth so much, a million playdates at each others houses and a few moments we have spent childless together, relishing in our (cocktail-fueled) temporary freedom that was previously under appreciated. But even if you're not a Mother, the moral of the story is the same: Girlfriends simply make our lives better. Instead of being close-minded about opening up your circle, try finding a little extra room. Compliment another woman's shoes in line at Starbucks. Tell her you also read that book and how it became a fast favorite. Schedule a yoga meet-up. Say hello. Smile. You never know who you will meet and how a little extra kindness and shared connections can make the difference. How do you make friends as an adult? If you ARE a Mama, do you find children have made it easier? It's been awhile since I wrote a baby (toddler 😂) update and more than anything, I just like to document things here now and then because it's an online diary of sorts and I enjoy coming back to see what we were doing together. Ro was 10 months in the last post of this series and needless to say, a lot has happened and changed in that time. As he's grown, I have claimed many stages to be "my favorite," but here I am, saying it again. He's just shy of 18 months (which seems like one of those WHOA milestones) and continuing to morph into the sweetest little man with a big heart and lots of opinions. When I ask him to give me a kiss, he plants a big slobbery wet one on my lips. He walks over to give me hugs all day long and waits for me at the bottom of the stairs, yelling until I come back. He certainly doesn't like when I leave the room and follows me every time I do, often times gnawing on the bottom of my shirt or scratching at my pants. He's definitely in a strong Mama phase, though if we're being honest, I secretly hope this is one he never grows out of. Here's hoping he still loves me this much at 18 years old...minus the shirt eating ;) He's becoming much more independent, acting upset when I try to feed him because he can do it himself (or so he tries) and is also very proud of his nightly teeth brushing routine, pushing his stool to the sink and brushing up and down, just like Mom. It's fair to say we spend almost every waking minute together and yes, there are some inevitable moments where I'm grinding my teeth, counting down the seconds until I get a break (especially after cabin fever builds up during the polar vortex)!. But, then the break comes, and I just end up looking at pictures of him or blogging about him ;) He's growing up beautifully and is the love of my life. Fruit: Even when he's going through a food freeze and refusing to eat, he'll still chow down on fruit. He almost never refuses it, especially its blackberries (obsessed), strawberries, blueberries, grapes and most recently, cherries. We've started going to Costco for our weekly fruit haul because he goes through it so fast and we can't keep up. Also, I don't remember the last time I had a damn strawberry because there's none left by the time I get to them. Just sayin! Mac & Cheese: The bane of every parents existence. I try pretty hard to diversify his eating habits and choices but when it comes down to it, his taste is pretty simple and he just wants to devour Annie's mac which I've come to love as well because let's be honest, I usually scarf his cold leftovers for lunch. Gotta rotate between the white cheddar shells and the classic blue box to keep things fresh and interesting over here. Meatballs: Loves 'em. The ones from Buona Beef are his jam but he doesn't discriminate. Pizza: Makes sense, because we've been participating in "Pizza Friday" with Mike's parents for as long as I've been in the Family (and his whole life before me!) so it's basically in Ro's blood/DNA/all that jazz. On new years eve, he ate an entire mini pizza and still had room for appetizers and dessert. When he wants to, he can certainly pack it away! Dino Chicken Tenders: Because who wants to eat them in a normal shape? French Toast Sticks: I won't lie - These have become a Family favorite. Frozen box from Aldi, pop them in the micro (but better in the oven) and enjoy. Holy cow, are those good! Remember when I used to eat healthy for breakfast? Me either. Overall: Ro is slowly getting better at independent play. Though, because I am home with him 3x a week, he is used to me being around him alllll day long so he still prefers me to be close, if not, directly interacting with him in whatever he is doing. I have noticed recently, his attention span has improved and he will play with one toy for longer periods of time instead of moving from thing to thing every 2 minutes. He is MOST interested in whatever I am doing at the time - If it's dishes, he tries to take them out/put them in...If it's baking, he HAS to stand at the counter with me, so I pull up his helper stool and he helps me add ingredients in and watches the mixer...If I'm drying my hair, he follows me into the bathroom and flushes the toilet incessantly. As frustrating as some of these things can be in the moment (because everything takes 10x longer), I also think it's adorable how he wants to imitate us and very sweet watching him try and often, clapping because he's so proud of himself . Hape Toys: If there was a "Mom's favorite children's toy" category, this brand would definitely win mine. I am a HUGE fan of their products and if I had to start over with our toy collection, I would probably buy exclusively from them. Hape Toys is one of the world’s largest producers of toys made from sustainable materials. The products are creatively designed, eco-friendly and so good at fostering imagination and age-appropriate learning basics; social, sensory, physical and emotional skills. Ronan currently loves playing with the pop up toaster set and to be honest, so do I. We spend a lot of time in the kitchen together, baking and him, just watching me make breakfast/lunch/dinner/clean so he's very interested in everything that goes on in there. That's why he also enjoys the coffee maker which they have at our library and the grill, which we recently played with at Waterlemon. These kid-size version of adult accessories and appliances are some of the cutest and most inventive products and they definitely didn't make them like this when I was little. On our Hape wish list? The Smoothie Blender, Cash Register and Waffle Maker. Ok, I'm starting to wonder if these things are higher on my wish list than his but they're SO DAMN CUTE. Our Library(ies): We are very fortunate to be surrounded by some of the BEST libraries in the area. Our town's library is amazing and before kids, I never knew how much I would end up utilizing it. We are here on a weekly basis, enjoying the play area, attending a story time or checking out books (which I've started to do for myself as well. Why was I buying so many for my Kindle?!). In addition to this one, we have 2-3 others in neighboring towns that we love going to and since our library card works at all of them, it makes it really convenient to check out and return no matter where we are. The Darien Library is another one of our favorites because Ro loves the kitchen setup and different baskets of activities they have to offer. The library is great when you just want to get out for a few hours and save money...you know, the opposite going to Target just to "walk around" and end up spending $100 in their dollar section. Whoops! We've also visited Woodridge, Elmhurst (mostly because there's a Brew Point inside!) and next on our list is Hinsdale. I love seeing how different they all are. Kidstreet: This little gem is one of my favorite places to take him because there's a wide variety of things for him to do there so he's always engaged and big PLUS, the Grounds for Hope Cafe that's attached is super convenient, not to mention delicious. I typically let him play for an hour or so, meandering to each of the different rooms and then we break for a snack (and an iced coffee for Mom), before playing a little more and heading home for a nap. The rooms are huge and organized by age group so that kids can get social interaction with their own age groups, but they have the opportunity to go wherever they please. It's always clean, safe and well tended to so I feel good about bringing him here. Waterlemon: This adorable play space is new to downtown La Grange and we're already big fans! This place is definitely a one-of-a-kind concept because it includes a boutique featuring unique children’s clothes, toys, party décor and gifts. There is also a café which serves coffee and snacks and the play place, suited for children 0-5. The decor is basically a Mom's Pinterest board dream come to life, carefully curated in trendy and stylish way, appealing to both children AND parents. Seriously, I wish our house looked like this and I'm not just talking about Ronan's play areas. Everything is clean, modern and the space is filled with every cool toy you wish your child had at home. We could spend all day here and next time we come, I fully intend to. Plus, I love that it's a Family owned operation and you can tell they are really pouring their heart and soul into it. Funzone: This is place you go when you have cabin fever and have been stuck inside for 5 days because it's -6 degrees out and you're losing your mind (aka us recently). It's pretty close to us and is by far the cheapest of our outings at just $5 for the whole day. It has an arcade, playground for bigger kids (though Ro loves this part the most, giggling as we chase him throughout it), toddler area, bumper cars, laser tag and a decent-ish restaurant and bar inside. We recently wanted to hang out with some our friends (half who have kids and half who don't) so we all met up here for dinner because it allowed all of us to talk and have a few beers and those of us who are parents didn't have to find any babysitters. Plus, some of my guy friends got pretty into the arcade games- seriously, there really is something for everyone. Dupage Children's Museum: This place is also in our top 5 but I feel like it requires a solid commitment because it's a bit of a hike for us to get there and there's so much to see so we just don't get there as often as I'd like. We are members because it's a great option to have in the Wintertime and they have so much to offer in addition to the museum staples. For example, we're doing "Breakfast with Daniel Tiger" soon and I look forward to trying other things like Family Night Out or Playshop. I feel so lucky to have so many amazing kind resources so close by! Staying in the crib! He has climbed out the pack and play at my parents house and has figured out how to climb in and out of almost everything else so we're just praying this doesn't happen for AWHILE. If he lays in there too long in the morning before we get him, he will try to lift his leg over but he's not nearly tall enough...yet. Oh, the anxiety! When people ask me lately how I'm doing, I feel like my answer is always, "busy." Every time. But, I would be lying if I said anything else. We're truly in that phase of life where everything seems chaotic and nonstop all the time but I am trying to embrace it for everything it is and p.s. if I feel this way with only one kid (and a very needy albeit loving, dog). I can only imagine how much more we will be able to charge for our circus whenever we decide to add to the Family. Ah, another post for another (future) day. For now, we are happy, healthy, exhausted and blessed. Mama's with babies/toddlers at home: What are they currently loving/hating/getting into? Should we add any places, foods or toys to our list? Tips and tricks? I want to hear it all! I usually believe in resolutions. I enjoy the feeling of a clean slate and the opportunity to right your wrongs. Feng your shui. Purge your closet, your basement, your life. In fact, I still have the "draft" saved in my gmail account that I started last January where I started to document 3 goals I wanted to accomplish each month because I thought that was more attainable than setting goals for the whole year. January read, "transition Ronan to his crib, make it to yoga at least once a week, find 20-30 minutes for myself every day and finish a book." All of these are highlighted in yellow because I had a good momentum in the beginning, as most do. However, there is only one goal highlighted in yellow during February and I can tell you it WASN'T "launch my blog and post once a week." Launched, yes - Posted once a week, no. Not even close. As I type this, I notice I haven't posted since December 11th and as disappointing as it can feel, it's just my reality right now and that realization of where I am in this moment is the driving force behind my semi resolution for 2019. Instead of picking a bunch of areas to improve on, I really have more of a broad goal that applies to so many facets of my life. I would just like to try and appreciate each day for exactly what it is. I've always been a person who thrives on looking forward to things, anticipating the future and imagining what could be. Plus, as parents, I feel like we get stuck in the calendar. We're always looking so far forward to find our next moment of happiness (a glass of wine when they finally sleep), relief from life (our next vacation) or anticipation of the next big milestone (in our current case, fear of climbing out of the crib). But this year, I hope to think smaller. Focus on this very day, this hour, this minute, this second. Find optimism and joy in the routine and the mundane. Since becoming a Mother, I find that I am wound very tightly all the time. I lash out at my husband when I'm stressed, rub my temples, curse under my breath and feel short on patience, all more than I should. I lose my cool when I trip over a toy on the floor (why are there ALWAYS things on the floor? Just sayin') and get anxious over the the inevitable mess. I raise my voice when he gives his food to the dog or tries to scale the gates. I don't like even typing these things out but I'd be lying if I said they didn't happen and I think most Mom's can identify. But as trying as it can be to balance it all, I know that this is it and there's no time to waste on negativity. It may feel like nothing is changing every time you turn down the covers at night but it is, however slow it may be. My son is now 17 months old in what feels like the blink of an eye and he is flourishing. He will be in school before I know it and I will look back on the best days when we were home together, him eating breakfast in his pajamas and me, eating his cold leftovers an hour later. It may not be glamorous and it certainly isn't easy. I may not create blog content as often as I'd like or make it to the yoga studio as much as I used to. But I am where I should be RIGHT NOW and it's perfect for exactly what it is. It's exhausting to dwell on the missed shots so I would like to find gratitude in all of the plays in between - the assists, the passes down court and the occasional slam dunk. Our life is beautiful on the good, bad and in-between days so here's a semi-resolution to simply just remember that, all year long. How do you feel about resolutions this year? So many things have changed since we became parents - Almost all of them for the better but let's be honest, your normal routine kind of falls by the wayside once a baby arrives and this includes any semblance of healthy eating. 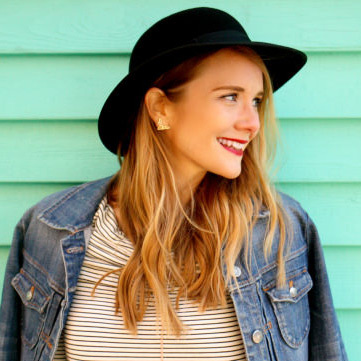 Before becoming a Mom, I considered myself a pretty healthy eater - I regularly ate salads, quinoa, breakfast smoothies, protein, heart-healthy fats, you name it. I have a sweet tooth but I exercised regularly and did a decent job of staying on track. But, NOW - Now, everything has changed. It's the typical Mom situation, where I basically finish my son's leftovers at home (typically chicken tender bites or mac and cheese - so cliche, right?!) and end up snacking on anything that's quick because if I'm lacking in anything, it's time. Unfortunately, dinners usually aren't that much better. By the time my husband and/or I get home, it's a rush to make dinner for all of us, play with Ronan and get his bedtime routine done on time. I've come to enjoy cooking from scratch but it takes time to find the recipe we want to make, make a trip to the store and then stand in the kitchen chopping veggies - this is NOT reality, guys...especially with a 16 month old running around and full time job. So, we keep the fridge and freezer stocked with things that are easy to make: Pasta with sausage, burgers, chicken tenders, sweet potato fries, etc. These things aren't necessarily "unhealthy" but our dinners certainly aren't as nice as it used to be when we had the time to spend cooking an extensive, homemade meal and furthermore, actually sit down to enjoy it. This is precisely why I was SUPER excited to partner up with Meez Meals! Do you guys know about them? I know there are so many different meal services, it can be hard to keep track but this one is nice because it's a little smaller than the others (they deliver to 9 different states), has awesome weekly menus and really DOES make it that quick and easy to cook. 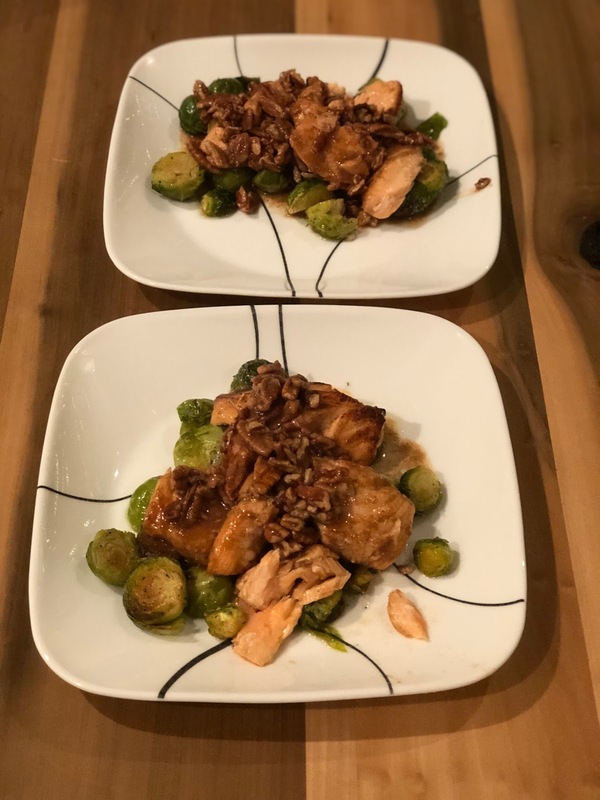 It is definitely my favorite service BY FAR because Meez Meals delivers everything you need to make delicious dinners from scratch which means the onions are diced, the spices are measured and all you have to do is put it all together, which is the fun part. There's NO subscriptions! You just get the meals you choose, whenever you want them! 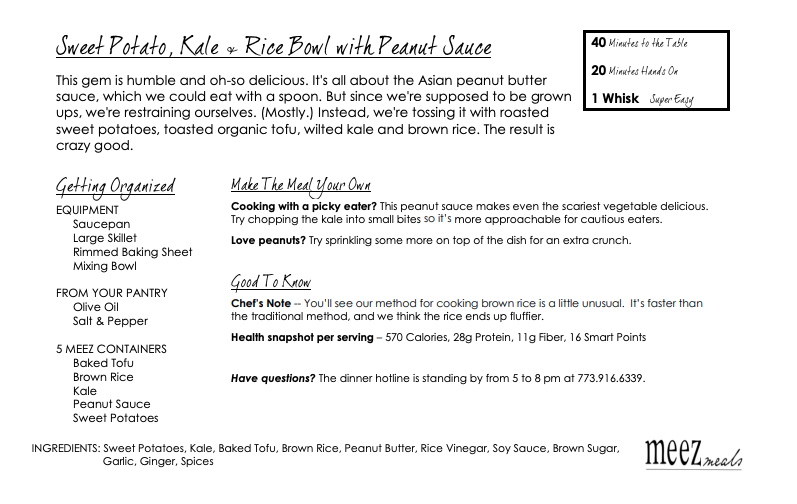 You can set your ingredient preferences: Gluten-free, vegan, allergies - They will cater to it all. 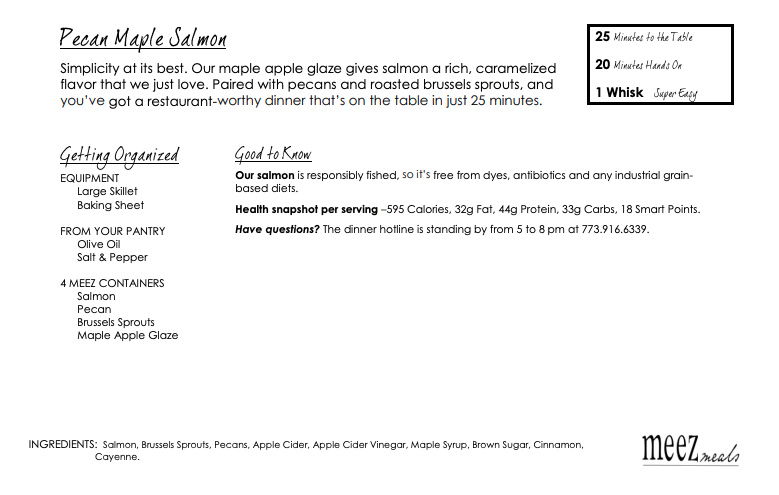 No Surprises: You can check out the cooking instructions and nutritional information before you order, so you get meals just right for your family. 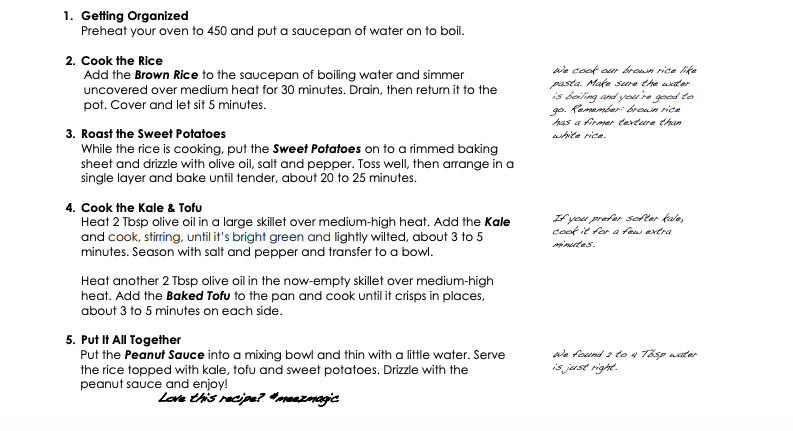 They even include tips to lighten up recipes and rate the meals from easy to more complicated. Low cost per serving: The larger the meals, the lower the cost per serving. It's value that’s family-and-entertaining-friendly. This was probably my favorite out of the two because I love all types of "bowls." Any rice/noodle/veggie/meat/sauce combo is great in my book and the ingredients in this one are perfect for cozy Winter nights, plus it's jam packed of healthy ingredients. I could've eaten the peanut butter sauce with a spoon and this was my first time trying tofu. I don't think it had much of a taste but it added nice texture to the bowl. Plus, I enjoy sweet potato everything (hello waffle fries!) And P.S. It even got my picky toddler to try a vegetable - I'll take it! This meal was EQUALLY delicious! If you asked my husband, he would confirm how many times I brought up the maple flavor and pecan topping while we were eating. 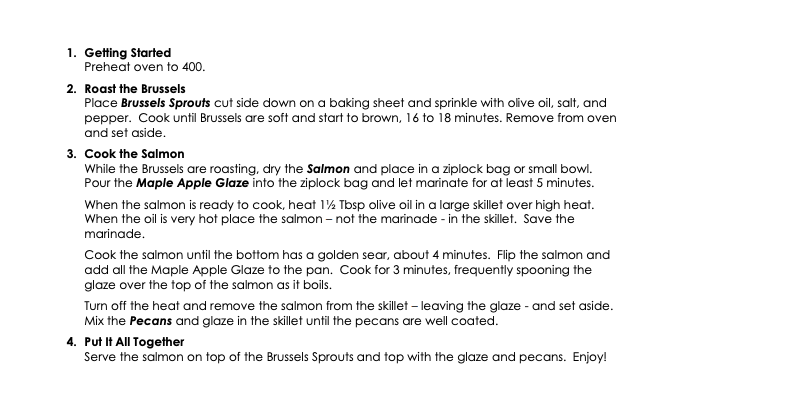 I've never eaten salmon with such a rich flavor and now I feel like I never want to have it any other way, Plus, it had been a while since we roasted brussel sprouts, and MAN, I forgot how good they are. It was SO nice that the brussels were already cut up and ready to be seasoned/cooked. 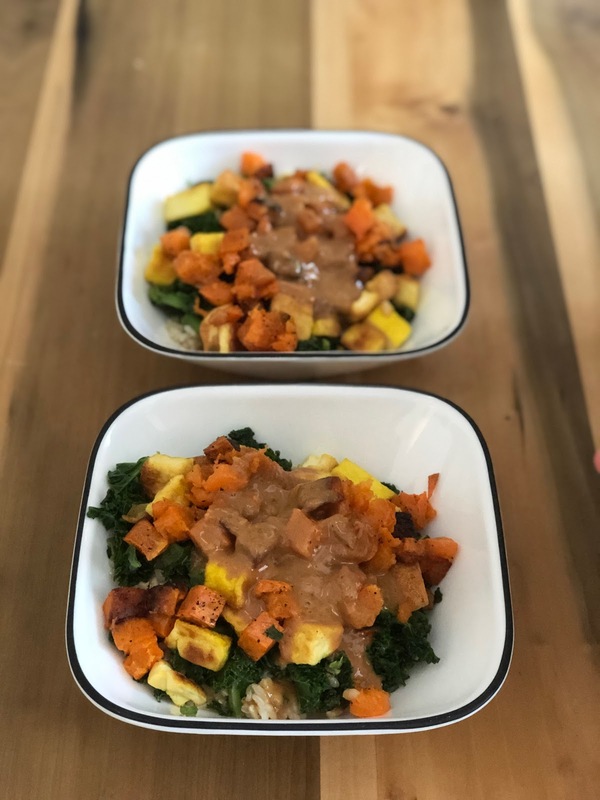 This meal took LESS than 20 minutes to get on the table and we felt really good when we were done - Nothing processed, just simple, healthy and homemade. 50% off YOUR first order: Use code Kait50p at checkout. I hope you will try it and love it as much as I do. I think the best part is you don't feel any pressure if you want to try it - You don't have to remember to cancel the next week and you won't get any annoying emails about your subscription. You can just order as often (or not) as you want to. I will continue to share our meals on Instagram so make sure to follow me there! If you try it, let me know what you think! One morning in May when my husband and I woke up, the first words out of his mouth were: "I booked us flights to San Francisco last night. I got a really good deal so we're just going for 1 night in September." First reaction) Thrilled. Second Reaction) Wait, what?! Third Reaction) Small detail...What about our son? My husband has done this multiple times before. Let it be known, he does NOT spend money on frivolous items, basically ever, but when he comes across a cheap flight or vacation, he does not hesitate. In years past, we've gone to New York for the day around Christmastime (doing every touristy thing imagine in under 12 hours!) and he also booked our trip to Ireland without much discussion, deciding the price was too good to pass up and it was a don't miss opportunity. We both share a passion for traveling so when he decides to book a trip on a whim, there are no complaints. Luckily, in this case, my amazing parents were willing to take Ro from Sat-Sun so we could enjoy a quick weekend getaway in wine country and by the bay. In addition to his last minute booking skills, Mike is also an expert trip planner with the great ability to narrow down the most important things to see, no matter how short a visit and in doing so, the teacher in him definitely comes out. He made a google doc of all the things we could do both days, down to the minute and plan b's in case something didn't work out. Quick background story: We were planning to catch the bus for our Napa Valley tour almost immediately after arriving in San Fran but our flight from Chicago was delayed about an hour and a half Saturday morning so we missed the shuttle that takes you to the wineries. We debated just skipping it and falling back on our plan b for the day but decided it was worth it to get there since we would make it for most of the tour, so we raced to jump in an Uber. A 4 hour plane ride, hour and a half car ride (and 100 something dollars later), we were finally at the Robert Mondavi Winery - Guess new-ish parents will do anything for a kid-free day filled with wine. P.S., we hadn't eaten anything (or had any water) since 8am and it was now 2:00 when we arrived, with wine being handed to us left and right, so I was sure we were going to be down for the count, but surprisingly, we handled it like champs and it felt so good to finally be there. Robert Mondavi was a great experience and the perfect introduction to Napa because it felt very classic. The winery was established in 1966 with a vision to create Napa Valley wines that would stand in the company in the company of the world's finest. The vineyard (actually located in Oakville, CA) is known for production of some of the finest Cabernet Sauvignon wines in the world which we can vouch for being completely accurate. I'm more of a Pinot Noir gal but we both loved their cab and enjoyed learning about their vineyards, the (very long and intense!) fermentation process and feeling like wine snobs for a day instead of just sticking to our usual Trader Joes/Aldi purchases ;) There are so many details you don't think about, like how long the wine ages in wood barrels (years!) and how a REALLY good wine has a REALLY good cork (not the synthetic kind that breaks when you use a corkscrew - too often that's the kind we end up with at home, lol). One of my favorite things that we learned that day? Once all of the juice has been squeezed from the grapes in their vats, the skins are still left over and it is literally someones job to get in a wet suit, dive into the tank and flush out all of the skins. Why didn't someone tell me it was ACTUALLY possible to swim in a vat of wine?! 🍷 Mental note: Switch careers. After our Mondavi tour, we finally got to jump on the shuttle with the rest of our tour to head to what was actually my favorite stop of the day, the Oakville Grocery. The store was founded in 1881 and is the oldest continually operating grocery store in California and not only was it the absolute CUTEST shop but I ordered one of the best sandwiches of my life, true story. That's saying a lot because I've eaten more sandwiches in my life than anyone you probably know but it was a turkey pesto combo on rosemary focaccia and not to mention, I hadn't eaten in 8-ish hours so it tasted particularly amazing. We loved walking around the store, looking at all of their delicious goodies and products from local artisans and foodies including everything from cookies to jams and specialty cheeses. I could have sat there all day, ordering coffee and munching on their tasty snacks. I love tiny places like this with history and I will definitely have to bring my Mom back one day! Once we had something to eat, we got our second wind and we felt ready to take on the second winery, Liana Estates. This place was the complete opposite of Mondavi, as it was established in 2016 so it was fairly new, off the beaten path and much trendier with a rustic wood finishes, a bocce pit out front and cupcake pairings on the menu. They specialize in different white varieties and even though I much prefer reds, I enjoyed quite a few of the white tastings because they were unique. we did the "Bay Breeze" tasting and I fell in love with their sparkling brut - I would've gladly taken that pour on repeat and also enjoyed the Orange Muscat. Our tasting host was so engaging and knowledgeable, giving us the rundown on how the winery started and what made each wine so different. She was a pleasure to talk to and really rounded out the experience for us. The tour overall was so much fun and we owe part of that to the tour company themselves, as our driver and guide for the day was exceptional. She's actually from the suburbs of Chicago and spent many Summers in Lake Geneva so we had a lot to talk about which made the long drive back to San Francisco fly by. She also went out of her way to drive us up to a lookout point so we could get out and take pictures of the sun setting over the Golden Gate Bridge. She kept commenting on how it was extraordinarily beautiful that afternoon and how lucky we were to be seeing everything lit up in this way. It really was the perfect storm of everything coming together at just the right time. There's really nowhere to park up there since it's so packed with tourists so we literally ran along the coast while she was circling, snapped our photos and ran alongside the tour bus to meet up with her and hop back on. Wine + photo taking, this was my ideal day, guys! Sunday, we got up early, enjoyed multiple rounds of our hotel's continental breakfast (literally the reason we CHOSE the place...who doesn't love a free meal?) and headed out for Muir Woods. I was very excited about this part of our weekend because I had visited the redwoods with the Family during our California trip when I was 9-ish years old so it was great to be able to come back and appreciate it in a mature way this time around. Before we started our main journey, the tour drove through downtown San Fran and then dropped us off at another perfect photo taking spot near the Golden Gate Bridge. The sun was shining and the waves were crashing and it was all just right. After a few snapshots near the Full House bridge (you're all thinking it, right?) we were on our way to the woods. The main attraction of Muir Woods are the coastal redwood (Sequoia) trees which are known for their height, and are related to the giant sequoia of the Sierra Nevada. While redwoods can grow to nearly 380 feet, the tallest tree in the Muir Woods is 258 feet and they are SO SO beautiful, especially when you are standing directly underneath the towering trunks, looking up at their seemingly never ending branches. Our tour guide dropped us off at the entrance to the monument and from there, we had 2 hours to explore on our own. We ended up choosing the longest path because we wanted to see everything we could and every step was more gorgeous and better smelling than the last. That's the thing about the outdoors - You couldn't bottle up the smell if you tried and there's nothing like it. We were in awe of the sequoia's, especially knowing how long most of them had been planted there and unchanged, despite mother nature's storms. We learned a lot of background about the monument which was really interesting. In the early 20th century, William Kent, a rising California politician his wife purchased 611 acres of land from the Tamalpais Land and Water Company for $45,000 with the goal of protecting the redwoods and the mountain above them. In 1908, Theodore Roosevelt declared this land a National Monument, the first to be created from land donated by a private individual. The original suggested name of the monument was the Kent Monument but Kent insisted the monument be named after naturalist John Muir, whose environmental campaigns helped to establish the National Park system. In 1937, the Golden Gate Bridge was completed and park attendance tripled, reaching over 180,000. Today, the park sees up to 6,000 visitors PER! DAY! After Muir Woods, our tour guide dropped us off in Sausalito for lunch and exploring. Unfortunately, we had an early evening flight to catch so we couldn't spend as much time here as we wanted but we made the most of it by grabbing lunch at an adorable deli and eating by the water before taking the ferry back to San Francisco. I loved looking at all the houseboats - Can you imagine? Such a different way of living from those of us in the Midwest. We also passed by SO MANY places to eat, shop and grab coffee in Sausalito which gave me a bit of FOMO but we will have to come back and just dedicate an entire day or weekend to sight seeing in this area. The ferry back to town was just as beautiful as every other minute of the day. We rode right by Alcatraz and had a great view of the skyline the whole way. It was the perfect ending to a spontaneous, San Fran weekend. Quick Link Guide of a few things we loved on our visit! Saturday Dinner: 54 Mint - This place was so cute and located right behind our hotel! We were EXHAUSTED by dinner time on Saturday so this was the perfect place because it was a quiet little Italian joint and we just sat at the bar and enjoyed some delicious pasta and sparkling water. Sunday Lunch: Venice Gourmet Delicatessen & Pizzeria: Family-owned and operated Mediterranean-style marketplace established in 1969. Great for a quick bite and again, one of the most delicious sandwiches I've ever had (I went with the Sausalito Turkey). Have any recommendations? Let me know! I remember going to classes in college that were a part of my "Gender & Women's Studies" minor, discussing and writing about feminism and thinking ahead to when I would eventually become a Mom. I always knew I would battle an internal struggle, feeling torn between having my job (or at least some sort of work I was passionate about), and being fully dedicated to raising children at home because that's what my Mom did and I loved every second of her being with me. The thing is, I've always wanted to "have it all" in many different respects: See the world but be a homebody. Practice a healthy lifestyle but indulge in ice cream. Have close access to a downtown area yet live a small town lifestyle. Live near my Family but move to the mountains one day. For me, it just seems like there's a constant push and pull to try everything and BE everything. Now that I have been a Mom for a year and then some, I still struggle with these things but over time I think we've found a healthy balance of it "all." When I started here as an intern, I never expected to be here almost 10 years later but I'm of the mindset that a lot of things happen for a reason. The company is very supportive of a work-life balance and generously agreed to letting me work from home a few days a week after Ro was born. As my maternity leave came to an end, I was having a very hard time with the thought of leaving him and missing all of the milestone moments as he grew up so I am very thankful they trusted and respected me enough to create a new schedule that would benefit us both. I work two full days in the office and three part-time days at home. While there are days where it would definitely be easier to be one place over the other, this is working for us right now in this stage of our lives. My parents take care of Ro when I'm in the office and we are endlessly appreciative of everything they do for us. He feels so comfortable at their house and I feel equally safe knowing he is in the best hands. Daycare was never a consideration for us - It's a personal decision and it was mostly based on the fact that I wanted Ro to be taken care of by someone close to us. He is making memories with his Grandparents, which is a blessing and a privilege. My 3 work from home days are a luxury but certainly are not easy. Even though I'm working half-days, there are a lot of moments where deadlines come into play so I am juggling graphic design files and keeping Ronan from climbing on our toilet at the same time. When he was a newborn, it was much easier to schedule conference calls and work on our loft computer because he wasn't mobile and slept - a lot. Now, these things require some extra prep, whether it's loading up a few Daniel Tiger's from our DVR (this is survival, my friends), or crossing fingers that he's either napping or eating lunch in his high chair at this time, which is basically the only 2 ways he is contained and quiet. It can be very stressful - some days, I just count the minutes he goes to bed and I can turn my brain off for a little while. He is extremely inquisitive and busy, more-so than I expected him to be at this age so a lot of my energy goes towards trying to keep him out of trouble (aka from opening the gate to the basement, pulling things down from the counter, trying to climb in the oven --> Yes, SERIOUSLY!) all while answering emails, finishing up marketing blast designs and trying to find a moment to eat/breathe. On the OTHER hand, I am very grateful of the part-time schedule at home because it still allows us to have some special time together which we make the most of. This Summer, we were at the park almost every day and on extra warm days, we enjoyed the water table on our deck or hit up a local splash pad. Now that it's getting cooler, we spend a lot of time at the library (checking out/returning books) and playing in their kids area, as well as enjoying morning music class with Tiny Toes and becoming official members of the Dupage Children's Museum which by the way, is going to be super helpful on freezing Winter days when going outside isn't an option and we're feeling cooped up in the house. I know, I know, we're already beyond tired so the thought of getting up early can seem repulsive but sometimes, it makes all the difference. If I wake up an hour or two before Ro gets up, I'm amazed at how much work I can get done in so little time without interruptions. Sometimes, I will have sent an entire morning's worth of emails before my co-workers even get in the office and it makes me feel ahead of the game. Not to mention, some quiet time to yourself in the morning isn't bad at all, especially because you can sip your coffee and eat something in peace! Naps are a work from home Mom's dream! Ro is still napping twice a day (usually) and both of them happen on a pretty regular schedule so I know exactly when they will happen and can plan out the most important things on my to-do list around these moments of quiet. Whether you have a kid who sleeps for 40 minutes (like mine sometimes does!) or 3 hours, learn how to utilize every minute of this time to finish assignments that require your complete focus and concentration. Most days, I don't even shower until 8:30 or 9pm, when I've gotten my work done and my son is asleep and I have time to breathe. It's not ideal (after all, pillow air dried hair isn't always pretty) but it just comes down to a matter of prioritizing. It's just inevitable that you will run into unexpected interruptions or sh*t show moments while trying to work and take care of a tiny human being at the same time. For example, there have been a few conference calls scheduled when Ro has a sudden diaper blowout or decides now is the perfect time to learn to crawl on top of our toilet and try to touch the light switches. These moments my friends are what the mute button is for! I try to spare my co-workers and/or clients as much background noise as possible so by muting until it's my turn to speak. This way, I can be actively listening and keep it professional at the same time. I just try to be prepared for anything to happen and have solutions for said situations that can be useful in a pinch. Easier said than done, right? I know. Ro is only 14 months old so he isn't quite ready to entertain himself just yet but I have found that if I dedicate a little time to getting him started with something, he may continue playing after I walk away, even if it's for 10 or 15 minutes. I consider those blocks of time to be good progress in his independent play and sometimes, it's just the amount of time I need to answer emails. In addition to his bin of toys in our Family room (which is where I'm often stationed with my laptop), we keep a box of books readily available, which I rotate regularly, a few Montessori activities (shape sorters, stackers) and as much as it pains my pre-parent self, we have a lot of his favorite shows DVR'd because he really enjoys them and they can often buy us an extra few minutes. Even though most days I'm exhausted and falling asleep with a book on my face in bed, I consider myself one of the lucky ones. My son is only going to be little for so long and I love that we get to spend this time together. It's also nice to have something that is my own, a job where the work is interesting, the people are great and the balance is respected. Mom's: What is your Family/Work balance like? Whether you are a full-time SAHM, career woman or both, how do you manage each role? © 2017 Felisha Renee. Site design by Heybi. Powered by Blogger.